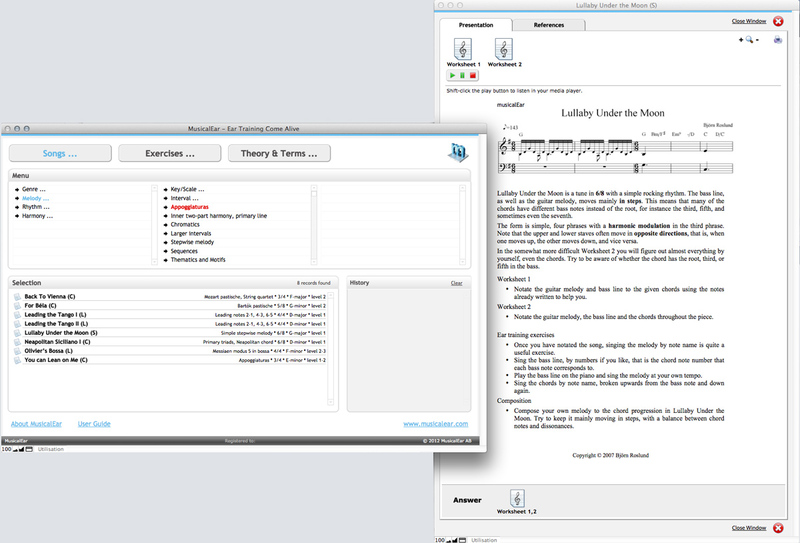 MusicalEar, Educative Software from MusicalEar. Available on Mac OS X and Windows, MusicalEar will train your ear and music skills based on songs from different music styles (jazz, classic, rock, pop, latino, folk...). The goal is to allow you to play melodies, harmonies, create arrangements and compose "by ear" (without the need to read a score). It can be used by both music students and teachers. 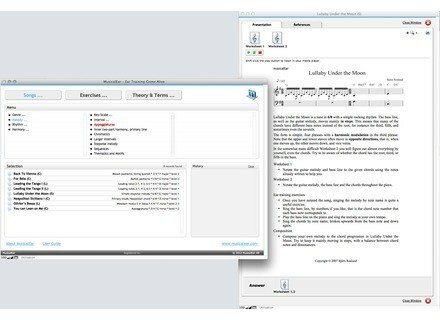 The software is organizes in three sections: Songs with MIDI songs composed specially for the application, with several difficulty levels, Exercises for intervals and Theory & Terms that can be used to "refresh" or learn theory notions, in particular with a term dictionary. Each song is completed by Youtube video reference songs and Wikipedia articles. Music sheets and exercises are available in universal PDF file, Finale (2012 version) and Sibelius 6/7 formats. MusicalEar is available in both english and swedish version. Single license retails for $156 (VAT included), $109 for students and starting from $100 per license for multi-user licenses with further discounts available. You can download a 15-day demo version from www.musicalear.com. Last beta before Rack Performer 1.0 Abeem Live Technologies releases update 0.99 beta 2 for its Rack Performer plug-in host software. Soundiron Bamblong v2 and discount through May 1st Soundiron released version 2 of Bamblong, its bamboo idiophone sound library, and launches a promotion on 7 sample banks. Nassen Software launches Modulys for Windows Nassen Software, creator of the free Rax'n'Trax pattern sequencer, introduces Modulys, an experimental MIDI plug-in for Windows.